Best movie of the summer. I didn’t decide that right away, but now it’s decided. Except for one plot hole that wasn’t explained, there is nothing I didn’t like about the movie. And if you think this movie is about Batman, you’re wrong. And you should have gathered that by the lack of Batman in the trailers. It’s all about The Joker. And every plot twist and turn is all about The Joker. And it was amazing. As I’m sure you’ve all heard by now, Heath Ledger’s performance as The Joker was phenomenal. I’d say he has a two-part introduction and after his magic trick, all I could think was, “I cannot wait for the rest of this movie to happen”. Luckily, it did. He was super creepy. The licking of his lower lip throughout the movie really added to the creepiness for me. The lack of music in just a few scenes was another major factor in the overall creepiness. Acting aside, the heists The Joker pulls are so insane and intricately planned, you can’t help but be blown away by all the twists and turns. The over two and a half hour movie never once had me hoping for the end of it. Except for the CG on one character, I didn’t take notice of the visual effects in this movie, which means they did it right. Or, at least I was sucked into the movie enough to not notice and nothing was bad enough to take me out of it. It was good work. It’s a very dark movie. Things you don’t think would happen (because in most movies they wouldn’t), *do* in fact happen. And the breaking of those “rules” is extremely refreshing. 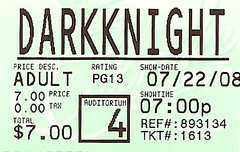 We saw this movie twice and I still give The Dark Knight a 5 out of 5 stars. With Sue as our guest this week, we each rented a movie to watch in the evenings. The Iron Giant was good in most aspects. Dialogue was funny and clever interaction between characters and even the story and series of events that occurred in the movie were interesting and kept me into the story – a lot like what Pixar does with their characters. The only criticism I have is on the animation. It could have been better. The movie was released in 1999. Toy Story 2 came out that same year. One year before that, was A Bug’s Life. Three years before *that* was Toy Story 1. So we know that 3D animation in a broad sense was already in the picture. Miles says the giant was in 3D, but I didn’t notice and I would have enjoyed The Iron Giant a lot more if Warner Bros. had been hip with the 3D scene for the whole movie. It would have been really good in 3D. I give The Iron Giant a 3.5 out of 5 stars. Vantage Point was a huge waste of time. Most of you know by now that the movie basically replays a short series of events several times from different character’s views and then one “this is how it happened” sequence. Even Matthew Fox wasn’t an enjoyment. The ‘rewind’ sequences were annoying and a waste of time. It’s like they just discovered their editing software had the option to fast-rewind and they thought seeing people move backwards was funny and wanted to show it off. The series of events that actually happened weren’t very believable. The 20 minute car chase will take you out of the movie, if you weren’t already. They didn’t spend enough time with each character for me to even care about them or get involved in their story. It was only 90 minutes but it was about 70 minutes too long. Other movies have done better jobs of weaving cross-over stories than this. It was a good concept, but it had already been done, much better. I give Vantage Point a 2 out of 5 stars. I had forgotten that we had seen the title sequence for The Kingdom on the internet a few months ago and how much I loved it. One of the best, if not *the* best, I’ve seen. It gives you the history in just a few short minutes and if you already know the history, it’s design is interesting enough to keep you entertained. I was concerned that the title sequence would overshadow the actual movie. I didn’t want the movie to be a waste when the title sequence was so great. But the movie wasn’t a waste. It’s definitely worth seeing at least once. While it *does* seem to take a while for any real action to take place (after the initial attack), the in-between time is entertaining and informative. I didn’t think the time in between was dull, but I could see how someone might get ants in the pants and find the time spent on the situation in Saudi Arabia a little boring. But not me. And if you look past the believability of four FBI agents investigating this attack and achieving what they inevitably do in this foreign land, then you can appreciate this movie. It was a stellar cast – and you just can’t go wrong with Jason Bateman, am I right? I give The Kingdom a 4 out of 5 stars. 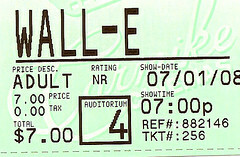 The Movie Club met for WALL•E tonight – saw it on DLP (so worth it). We have been looking forward to this movie for over a year – since we’d seen the preview last summer, I think for Pirates 3. So I was worried the anticipation would ruin it because expectations would have been high. I was glad to find out little was ruined. The animation and modeling were the best I have seen from Pixar, yet. A lot of it looked almost photo realistic. Except for the animated humans…they looked like all Pixar humans look like, so sometimes it felt a little strange to be seeing such detail in the robots and such simplistic renderings together in the same movie. Pixar is known for their detail. And this movie is no exception. With every scene, I learned something new about how Wall•E works. And I actually craved to know more about the other robots we saw and all of their little characteristics, but there’s only so much you can do. I really enjoyed the future Earth (over 800 years from now) and the little history you find out from all the piles of junk Wall•E sorts through. For this paragraph alone, it is worth seeing. The character interaction was more than I expected. Pixar does a great job with dialogue, but as you’ve probably guessed by any previews you may have seen, Wall•E doesn’t have much for vocabulary. And yet, somehow they were able to make me giggle, almost non-stop at times with his “dialogue” and interactions with things/people/robots. There were a few disappointments. One of the things I love about Pixar is how they make a whole new world in (most of) their movies. Like Monsters, Inc, Cars, Finding Nemo. And they always take it to that next step. I wanted to learn more about Wall•E’s life on Earth. I wanted to learn more about what was going on in space. But they make up for it in Wall•E’s and friends’ character development. Unfortunately, I sometimes felt like Wall•E’s character development was so advanced, that we missed jokes and quirks. And that makes me think the younger audience it’s bound attract will miss even more. Which brings me to my next disappointment. I felt as though the plot was pushing some agendas. An environmental agenda and a “keep yourself healthy” agenda. While I don’t necessarily disagree with the agenda, I do disagree with pushing it in a children’s movie. The last thing I was slightly disappointed by was how slow the movie felt. While I was always fascinated by Wall•E and some other characters, the plot *was* slow and simple and the lack of *real* dialogue would make it extremely hard for a younger audience to interpret or pay attention to. This movie is best for upper-elementary school aged and above. I’ve got to leave you with a happy note. 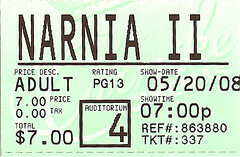 It was a great movie and not at all a disappointment, worth seeing in the theaters. I give Wall•E a 4 out of 5 stars. And for the Mac users, there’s a few surprises for you. Oh yeah, also, I *love* Pixar animated shorts. I don’t think this has been advertised very well, so I decided to post about it. Insight Marketing of Sioux Falls had a call for entries in the Art Circulator Show & Sale. Artists in the area could submit an unlimited number of pieces to be auctioned off until June 29. I submitted two photos that you’ve likely seen on this blog before. Fifty percent of the proceeds go to the artist, and the other fifty to Children’s Home Society. If you’ve got a blank space on your wall begging you to add some culture to it, consider bidding on one of the pieces! If nothing else, at least check them out. The characters were well-developed and even though the actors had three years to get taller, grow facial hair, etc., they genuinely seemed to only be about a year older. Neither they nor Prince Caspian, however, were what impressed me most. It was the Narnians. The animation and modeling of these characters was strong and believable. The two I was most impressed by were the centaurs and minotaurs. The centaurs walked and galloped in life-like ways. The area where the man becomes the animal really looks smooth and makes sense. The minotaurs are almost overwhelming with their strength, height, and other physical features. They look powerful and definitely lead the way in the battles. The battles. Oh, the battles! They were COOL. Set aside the fact that they don’t show anything gory (cutting to a new angle right before someone slices a soldier’s neck, no “gross” sound effects), these battles are really neat to watch. They’ve got a few tricks up their sleeves and that makes these scenes even more exciting.Â I give this a 4.5 out of 5 stars.